Are you looking for some incredible medium length hairstyles but aren’t sure where to start? That’s okay! It can be hard finding a hairstyle you like, particularly one that will actually work with your hair type, your face shape, and your personal preferences. Not to fret; we have tons of options down below that are versatile and gorgeous. You’re practically guaranteed to find one that you love! Let’s get started, shall we? Take precaution with this hairstyle, because big, round curls can easily scream “1950’s PTA meeting”. However, if done right, it looks absolutely gorgeous and is the perfect flirty complement to any look. It can be worn just as well with a casual outfit as it would with a dress and heels! Are you looking for medium length hairstyles with bangs? If so, you may feel limited to only a few looks. However, that’s just not true! There are tons of gorgeous options out there; just follow our lead. Blunt, thick bangs can both look and feel heavy when you have a shoulder-length cut. Keep the look textured and soft, and you’ll love how your bangs frame your face to perfection! Wearing curls doesn’t have to mean them just being in your face the whole time! Shoulder cut hair is very versatile, despite what many may think! Create these voluminous curls by wrapping two-inch sections around a one-and-a-half-inch curling iron. After you’re done, gently run your fingers through them for a softer look. We love this look for dinner parties! Want to keep things simple and sophisticated? Medium haircuts are perfect for that! Or perhaps you’re just feeling a little lazy or are running late and still want to look good. No worries! Simply run a flat-iron through your hair, spritz on a shine spray, and tuck it behind your ears! If you’d prefer, or if you have thick hair, utilize a few hidden bobby pins! Need some medium length hairstyles for thin hair or thick hair? This one works perfectly for either one! This beachy, relaxed look is perfect for the beach, just as well as indoors. 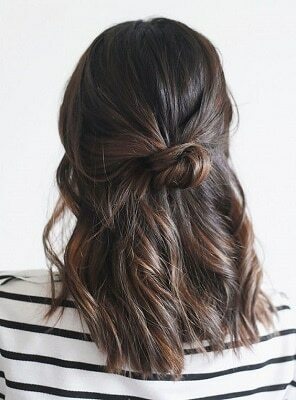 These loose curls are super easy to create. Simply use a wide iron, and wrap sections of hair loosely around the iron. Keep the curl held for about half the amount of time you normally would for curls. After you’re done, just spray with some hairspray, and you’re all set! If you need to keep your medium cut hair out of your face and don’t have bangs, then a simple, cute twist and pin will do the trick just fine! 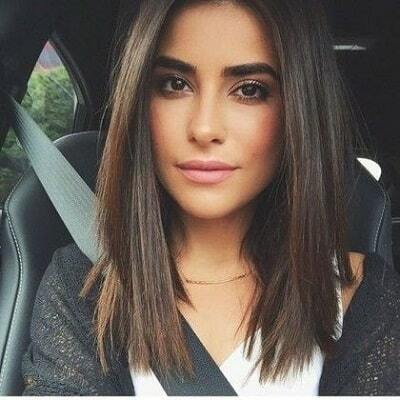 We personally love this look with a long bob haircut, but it works with a bob and any hairstyles longer than that. The half-up, half-down style is in style now more than ever; and so are twists. Simply twist and pin the top section of your hair and secure it against your scalp! If you’re struggling with making your short to mid-length hairstyle stand out, we have just the trick. Sure, you could go with any of the styles above, or you could make it turn heads without having to style it anyway at all. How? 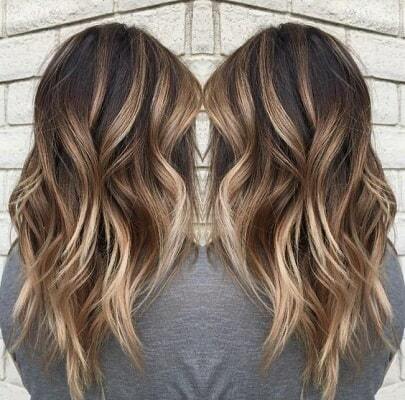 With Balayage. 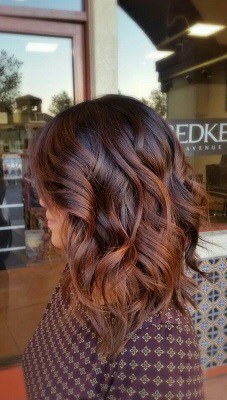 Balayage is essentially a freehand hair-coloring technique to give a super-natural blended look. It’s a kind of sun-kissed look that is in no way harsh or unnatural-looking, and looks even more stunning when paired with soft waves! If you’re wondering to yourself, “What is the most Instagram-worthy hairstyle for shoulder length hair?”, this is it; well, at least for this year. We absolutely love the combination of braids with shoulder-length hair. The half-up, half-down style is staying consistent hear and is much easier to create than how it appears. Simply braid and secure the top section of your hair, and curl the bottom part with loose, soft waves. 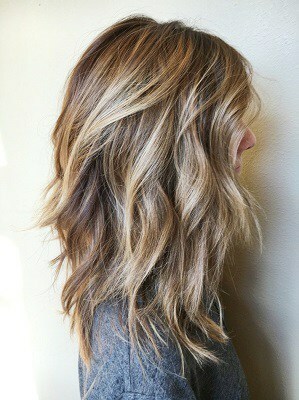 The last style was also a perfect example of this, but we absolutely love how it looks on Ashley Benson, too! There was a time when we would do anything to hide our roots, but lucky for all of us procrastinators, it’s now in to show your true colors! It’s a super simple way to grow out bleached hair without looking like you missed your hair appointments! If you’d like, you can have your colorist blend in some of your natural colors to your dyed color to make it look even more natural. On the hunt for shoulder length hair with bangs but can’t decide what kind of bangs you want? Sometimes feathery or layered bangs can get in the way or just not frame your face the way you’d like. That’s okay because you have options! Check out this super-trendy, unique style: the baby bangs. Wispy, feathery bangs highlight all the parts of your face you want while still keeping your eyesight clear! Did you really think disco was out of style? If anything, it’s only coming back bigger! If you are looking at haircuts for thick wavy frizzy hair, don’t let yourself pass this timeless style up! This style will show off that you’re confident, and not someone to mess with! 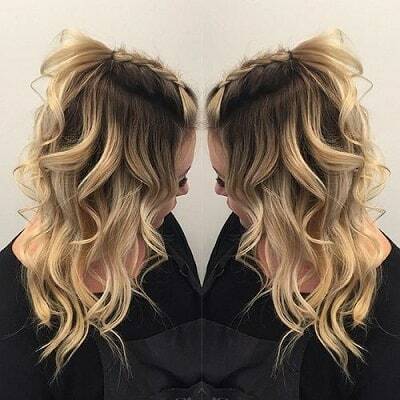 These lightweight curls look absolutely gorgeous with a silky dress, but if you’re feeling more jeans and a t-shirt, go for it! There are plenty of hairstyles for thick, coarse hair out there, but few compare in levels of sophistication to the pinned-back tuck. If you have more hair than you know what to do with or are getting frustrated with some gnarly cowlicks, then look no further. Simply create some elegant curls, and pin back one side of your hair behind your ear for some sophisticated asymmetry. So, this may seem like an unbelievable choice; a simple ponytail? It’s not just the fact that it’s a ponytail, however, it’s in how you do it! This perfect example is gorgeous and flirty, and goes well with literally anything in your closet! Simply slick back hair into a tight pony, then tug the hair above the elastic to create more height and elegance. Then, twist pieces of hair around a curling iron, brush and repeat. You can use this style for above shoulder-length hair and long, and it’s guaranteed to look wonderful on you no matter your hair type! Simple enough, right? There’s no need to overcomplicate things when it comes to beauty. Sometimes the simplest of looks catch the most attention or make you feel your best. We’ve featured a ton of curled looks here, but we don’t want to underestimate the beauty that straightened looks can bring, too. 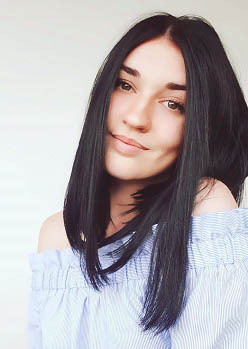 Medium-length hair is perfect for straight looks, as you don’t waste a ton of time doing it, and it doesn’t elongate your face like long looks sometimes can. Simply add a heat protectant and run an iron through your locks, and you’re ready! Here we are at the end of our list and we’re just now getting to medium length hairstyles with side bangs! That doesn’t mean we don’t like them, because we actually love them! We’re just saving (one of) the best for last. For those of you blessed with thick manes, you’re going to love this one. This tousled look is super easy to style and wear, and is perfect if you don’t feel like styling much! Now that you’ve had the chance to go through these 15 incredible medium length hairstyles, which one do you love the most? The good thing is that you don’t have to decide between them! You can wear a different one every day, or decide to even color your hair like we’ve shown here for an easy way to improve the look of your shoulder cut hair without doing a thing to it. The options are endless! Thanks for tuning in! We look forward to seeing you soon!